The 2020 Porsche 911 Carrera S is all-new, and it’s bigger, faster and a little more awkward-looking. 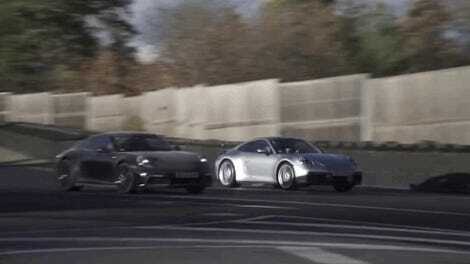 Here are the major differences between the new 992 generation and the outgoing 991.2. As somebody who was personally hoping for a slightly more dramatic departure from the previous couple of generations of 911 designs, I have to say I feel like I jinxed it, as the new single-blade rear tail light look just sort of hovers awkwardly over the back of the car. Maybe if the light bar was lower, or just bigger and thicker, it could pull it off. That engine-grille mounted brake light isn’t great, either. I think things improve when the entire top half of the rear-end lifts as the active aerodynamic spoiler. Up front looks very similar to what came before, except now there’s a giant squared-off mouth guard with active aerodynamic cooling shutters on either side and more pronounced wheel arches. That’s because Porsche also widened the front track and lengthened the wheelbase, and the new 911 will now just have one body style across its range, unlike the last generation where only the four-wheel drive cars were slightly wider. Not only does it look bigger, but it’s also about 121 pounds heaver than the outgoing car. The interior has also been overhauled, the PDK now has an eighth gear, 0 to 60 mph acceleration has improved, and it’s now capable of something called “wet mode,” which is absolutely hilarious. Whether or not you like the look of it, it sounds like it will be at least as good to drive as the last one.